It’s time for another game day here at spalanz.com and, because I’ve been so tied-up with writing an essay lately, I’ve not managed to get in as many games as I’d like. 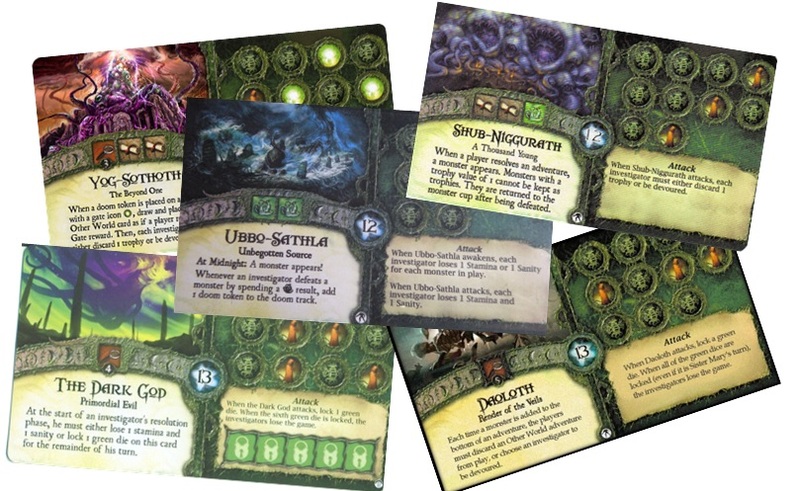 Consequently, this will only be a little blog for today as I take a look at some of the smaller stuff available to expand your games of Elder Sign. Let’s begin! Fantasy Flight recently released Grave Consequences, a small expansion of print-on-demand cards to enhance the play experience. This is really a collection of three mini-expansions, modular by nature, that echo a lot of the content put out for Arkham Horror back in the day. Most obvious of the Arkham tie-ins is the deck of Epic Battle cards. If you’re not careful and the Ancient One’s doom track fills up, it’s usually a case of battling back and forth as you try to remove doom tokens before being devoured, but now we have this little deck that adds a bit more theme to the final confrontation. It’s very similar to the deck introduced in Kingsport Horror, with each card usually split in two, describing effects when the investigators attack, and when the Ancient One attacks back. Some cards are ‘battle events’ that tell you to do different stuff before drawing a new card. Either way, it’s a nice addition. The real meat of this mini expansion, for me, is the Phobias deck. Whenever an investigator goes insane, rather than being devoured, they replenish their sanity but draw one of these cards, which has some kind of lasting effect for the rest of the game. 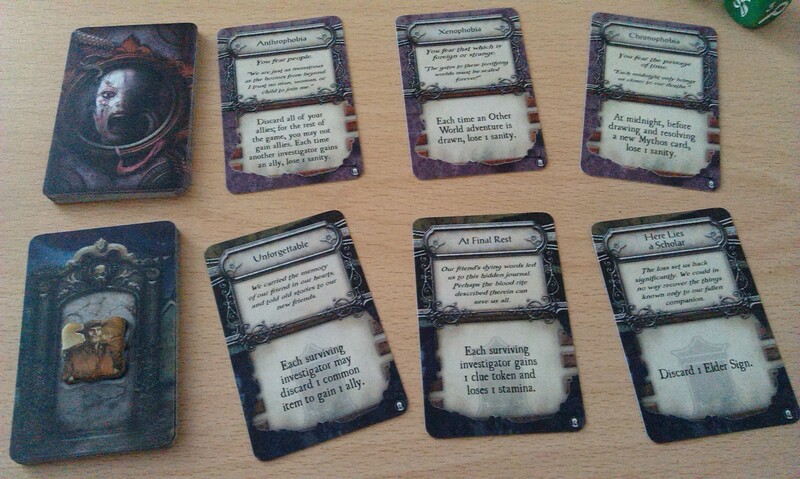 Very similar to the Injury and Madness cards introduced in Dunwich Horror, this is really what I got the expansion for. The third and final deck is the Epitaph deck, which acts as something of a parting shot for a devoured investigator. When your chap is devoured, you draw one of these cards and resolve its effects, before then placing your character chit on the card back. Personally I would have preferred to see an Injury deck to parallel the Phobias deck, but maybe that will be for another expansion. At any rate, it does add a nice bit of theme to the game! The rest of the stuff I’m going to talk about today is promotional material that is largely freely available online, thanks to the terrific folks over at boardgamegeek.com. In October/November every year, FFG run an event called Arkham Nights, which allows folks to come together to play one of the many Lovecraftian-themed games the company produces. Each year, a bag of swag is given out that has ties to some of these games, the most recent event having domain cards for Call of Cthulhu LCG, for instance. However, since 2011, all of these events have also featured a promotional Ancient One card for Elder Sign, which I think is both really cool and bums me out, because I can’t make it to these things to enjoy the goodness! While it bums me out that I don’t get to enjoy the properly-printed cards, Ancient Ones are normally a card where it doesn’t matter if the cardstock is different. I know some folks like to shuffle it up and pick their AO at random, but I prefer to know who I’m facing (largely I choose the AO because I don’t want to be playing the same ones over and over). All of these new Ancient Ones has something interesting to offer. I particularly enjoy Daoloth, whose gameplay effect really makes you consider if you want to visit that Other World for its Elder Signs, or else leave it in play in case a Mythos card forces you to place a monster. I recently played against The Dark God for the first time, whose effect quite sinister in that he forces you to lose one stamina and one sanity or lock a green die on the AO card for the remainder of the round. It sounds pretty bad, though there are plenty of ways around this kind of loss that it isn’t always that bad. Their effects can be quite alarming, however, and they often feel like they’re more complicated than the regular release Ancient Ones. Ubbo-Sathla, from last year’s Arkham Nights, has a lot of interaction with monsters on the table, and while he’s one that I find myself looking forward to going up against, I foresee some complicated game-states to come! Lastly, we have the two promo adventure cards, The Hand of Solace and Log of the Persephone, which can be seen on the right of my tweet above. Unlike the promo AO cards, these ones really need to be the proper printing, of course, as they’ll get mixed into the deck. FFG made these available via coupons printed in the back of some of the books they published that tie into the Arkham universe such the Dark Waters trilogy. For the cost of shipping, and tearing a page out of the book, you could get the cards sent to you. Personally, I’m not a fan of tearing up books, but additional material for my favourite games is perhaps worth it! A lot of people on the internet will tell you that these books are crap, but I actually liked those that I’ve read so far, and have even written a blog on the Dark Waters trilogy! 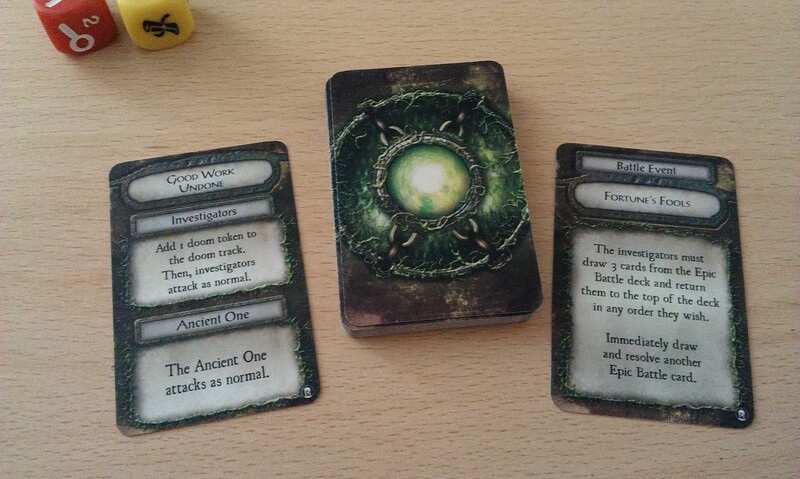 So there you have it, a bit of a whirlwind tour through the extra bits available for Elder Sign, a game that I haven’t played recently as often as I would like!